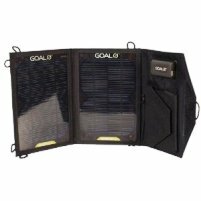 Goal Zero is a pioneer is the portable solar charging industry, making some of the best chargers on the market. There are many products, but this review will look at three of their most popular models: the Nomad 7 foldable solar panel, the Guide 10 Adventure Kit and the Sherpa 50 Adventure Kit. Each one has different features, making them perfect for different uses or trips. The Nomad 7 is a very compact and lightweight solar panel. When folded up, it is not much taller than a pencil, and it’s about as wide as a small journal. The solar panel can collect about seven watts of energy from the sun, and the output is around five watts. You can also connect a USB or 12V connecter right into the solar panel, so you can charge directly from the sun. The carrying case is both weather-resistant and convenient. There are many small pockets that allow you to carry small items, like additional chargers or small devices. When it comes to charging, the Nomad 7 is rather efficient. It takes about two to four hours to charge most devices, including cell phones, MP3 players and GPS devices. Overall, this solar panel is great if you need compact power, and you only need to charge small devices. It isn’t powerful enough for larger devices, so don’t try to use it for a computer or TV, but it is great for trips where you are only packing the essentials. The Guide 10 Adventure Kit includes several items. You get the Nomad 7 solar panel, and you also get the Guide 10 battery pack, along with rechargeable batteries. This kit offers more power and versatility than the Nomad 7 panel alone, and it can charge some medium-sized devices. The entire kit is about the size of a small novel. With the Guide 10, you get a USB charger that you can easily use to power most USB devices. Along with this, you get the rechargeable battery charger. Four AA batteries can be charged in just a matter of hours, and they can be used in flashlights, lamps and other objects that do not have USB ports. This unit combines the Nomad 7’s power, with better USB support and rechargeable batteries. If you are going on a trip and you need battery-powered items, and if you want to better power your USB devices, then this charger is perfect. It is very versatile, compact and easy to carry around. While it isn’t great with many medium-sized devices, it normally powers devices up quicker than the Nomad 7. The Sherpa 50 Adventure Kit is substantially larger and heavier than the Guide 10 Adventure Kit, but it is still very compact and about the size of a normal to somewhat large novel. The items you get are similar to the Guide 10 Adventure Kit, but this is meant for more powerful charging. Weighing about six pounds, you also get the Nomad 13.5M solar panel. This panel collects more energy than the Nomad 7, so this can power medium-sized devices. To charge the Sherpa 50, you can either use the Nomad 13.5M solar panel, which takes about eight hours, or plug it into the wall for 2.5 hours. You can then plug any USB or 12V device into the Sherpa 50 for quick charging. Though this device is not quite as compact as the two smaller units, it is still very easy to carry. If you have some serious power needs, then this unit will be perfect for your trip.